Too much running the past couple of days. Just found my time from 5-10-10. I was over a minute slower but did 40 more pounds on the deadlift. Bear I want really bad to say I agree with you about the “too much running” However….as much as I hate it I can tell it’s getting easier for me which is A GREAT THING considering I don’t LIKE it! I don’t think we were doing enough running before and you could tell when we would do it. oops should have said badly not bad…. Check the numbers, they never lie, everyone across the board has made improvements to their running without the normally associated over-use injuries and monotony at higher volumes. VIVA the ROWER Moreover the folks who took Thurs off definitely were at a competitive advantage with fresher legs. A programming error on my part, or just a challenge to be met and overcome to make you that much stronger, you decide. Last time you didn’t WB at the male height and it was about 25 degrees hotter. Heat will cause you to fatigue faster(explains a lot). yes and my lil break on the floor that I took after the first round of wall ball/row didn’t help with time either :/ that was the point where everything after was dig deep….cause I didn’t think I could get up and do that second round…. I’m soooo glad I’m not doing ANYTHING that has to do with working out today! DL 205lbs/400m run at 10:14m and wall ball/500m row at 8:10? Was not feeling it this morning. Legs were dead from WOD at 5:30p last night, and 205 felt very heavy. DL/Running always = “painfully” slow run. The Med Tech in me wanted to do the same weights that I did last time. 115#DL/ 400m run in 8:25(did it in 8:05 in May) :/. Wall ball 12#/500m row in 9:41(did it in 10:58 in May) :)). In awe of the girl-rillas who went up in weight and lowered their time. Atta girls to those who did this for the first time. Karen and Leslie I miss you. Cassie/Laura, Brad/Zach- GO TEAM SILVERBACK! Go get ’em tomorrow at the challenge, can’t wait to hear all about it. PS: Hooray, the training logs are in :0. They are $15/book. I will be there on Saturday and at most of the classes sometime this coming week. 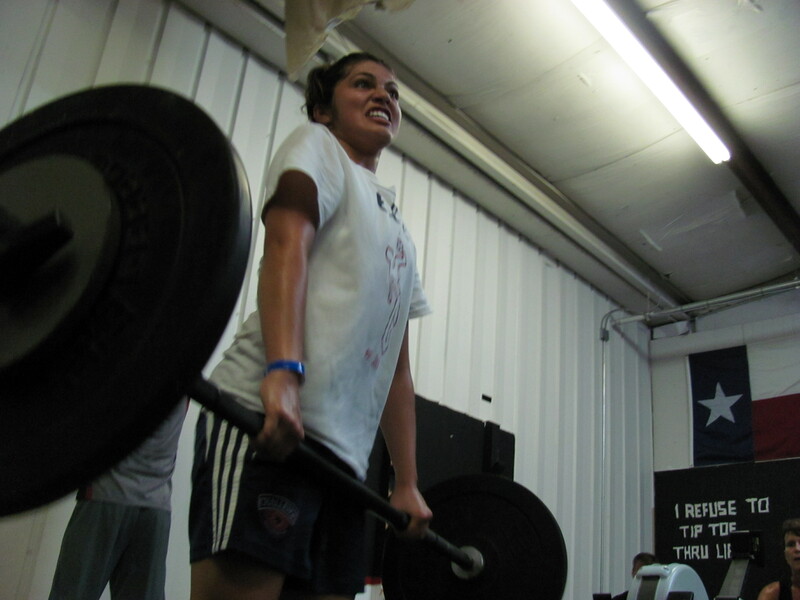 Today was brutal…BUT I deadlifted 125 lb and ran in 7:something so I was pleased with that. 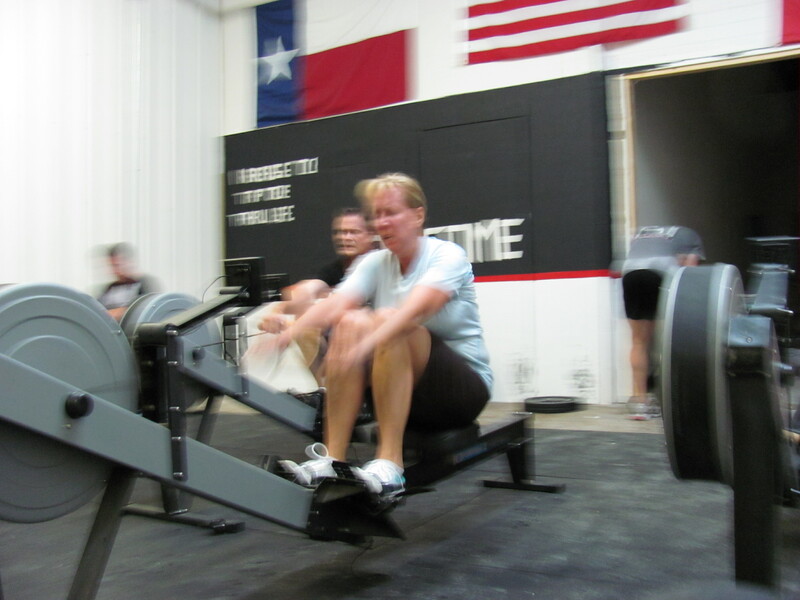 Wall balls and rowing…uuuhhhhggg…time: can’t remember but I don’t think it was great. I’m just proud I survived the run which has proven to be quite difficult at 9:30am. Can’t decide what’s worse, getting up at 4:20am or running in the heat at 9:30am? It’s a toss up. Did 3 kipping pull ups but they were ugly, but Casey said I’ll never get better if I don’t TRY! So I TRIED!!! See you all on Saturday. Gary and I plan to be there to help. Clearly I will need to repaint the wall in the rear of the gym. “I’ll try”…………. you know. I pushed it on the DL/run and then I had nothing in the tank for the row/wb. It’ll be interesting next time we do this to try the wb/row first & the dl/run next.